Battlefield V is bringing some big changes to the series’ well-established multiplayer. Soldier movement, building destruction, and squad coordination are among the elements getting makeovers in the upcoming installment. A lengthy post on the Battlefield site provides the most detail we’ve seen on the game to date. DICE is making significant changes to key areas of Battlefield this time out, it seems. You’ll have more movement options, like the ability to sprint while crouched and to backpedal while lying down. Weapons will have more firing positions, and you’ll be able to roll and leap through windows, and pull downed teammates to safety before attempting to revive them. Prep for battle with our list of the best WW2 games on PC. 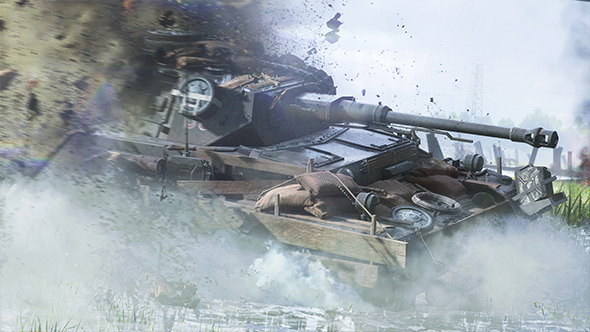 The Battlefield team has added more physics interactions with the world, so tanks will push walls inward, while explosives that go off inside structures will push them out. But to counter destruction, they’re adding fortifications that include foxholes and sandbags. Squads are going to have more reason to stick together, gaining resources and the ability for non-medic classes to revive squadmates. Squads that accumulate enough resources are going to gain options for calling in V2 rocket strikes, smokescreens, and other support. The full rundown is available on the Battlefield site, and it goes into detail on how bullet penetration and aim have gotten revamped for Battlefield V as well. Earlier today we learned about Airborne Mode, which will have squads parachuting into combat to take out strategic positions, so it sounds like Battlefield V is going to be quite a bit more than just an updated version of Battlefield 1.